Formula 2 Plus - Treatment for Excessive, Problem Nails. 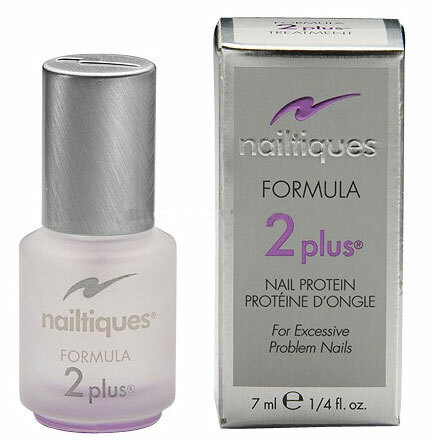 Nailtiques Nail Protein formulas were created to treat different nail conditions. The salon-tested formulations offer special combinations of ingredients, including hydrolyzed keratin and protein in combination with gelatin and calcium to build a healthy nail foundation. The protein formulas bond the nail layers together building a strong nail foundation resistant to peeling, chipping and splitting. Formula 2 Plus is slightly stronger than Formula 2. This formula is an option for those who have used Formula 2 for at least 6 weeks without color polish and desired results have not been achieved. It is designed to assist nails in overcoming stubborn problems allowing firm yet flexible nails. Apply daily. As nails respond, decrease application. Once nails have improved, return to Formula 2 until nails are healthy. Contains less than 2% Tosylamide Formaldehyde Resin. Although the formaldehyde is trapped within the resin, which is not said to be adsorbed in the bloodstream, it may still cause an allergic reaction to those sensitive. 79 years old and terrible nail-but not any longer!!! HAVE THANKED HER OVER AND OVER.